1) Regno di Due Sicilie – D’azzurro all’albero di verde nudrito sopra un fiume d’azzurro, accostato da due leoni d’oro controrampanti; e nel capo tre stelle d’oro in fascia. – English: Kingdom of Two Sicilies – Light blue in color with a green tree, placed above a river of blue, all paired by two contrasting gold lions; in the head three golden stars in the band. 2) Regno di Due Sicilie – D’azzurro al pino al naturale sulla campagna erbosa, con due leoni d’oro controrampanti al medesimo; e con tre stelle d’argento male ordinate nel capo. – English: Kingdom of Two Sicilies – Light blue in color, with a natural pine that stands on the grassy countryside, and with two contrasting gold lions on it; and with three silver stars badly ordered in the head. 3) Regno di Due Sicilie – Di rosso all’albero d’oro, addestrato da un leone del medesimo, rivoltato cd affrontato al tronco. – English: Kingdom of Two Sicilies – Red with a golden tree, with a lion on the right, turned cd and faced to the trunk. 4) Regno di Due Sicilie – Troncato al 1° d’oro all’aquila di nero sorante; nel 2° d’argento al palo composto d’argento e di verde, accostato da due pali di rosso. – English: Kingdom of Two Sicilies – Truncated. In the first part, there is a golden eagle in black; in the second, a silver pole made of silver and green, flanked by two red poles. 5) Regno di Due Sicilie – D’azzurro a due alberi nudriti nella pianura erbosa: il tutto al naturale. Col capo d’argento all’aquila bicipite di nero, coronata all’antica sulle due teste, all’imperiale, fra Ie medesime, e caricata in petto da una croce patente: il tutto d’oro con una fascia di rosso caricata di tre stelle d’oro di sei raggi attraversante sulla partizione e nell’aquila del capo. – English: Kingdom of Two Sicilies – Light blue with two trees grown on the grassy plain: all natural. On the silver head of an old-fashioned, black-headed two-headed eagle with an imperial style. Among the same heads, a patent cross is loaded in the chest: all in gold color and with a red band, loaded with three golden stars of six rays, which crosses the partition and in the head of the eagle. 7) Napoli – D’azzurro e a due alberi al naturale e nudriti sopra un terreno di verde; col capo d’argento e sostenuto dalla dlvisa dl rosso e caricata di tre stelle d’oro; il capo stesso caricato dall’aquila bicipite spiegata di nero e membrata e imbeccata e coronata d’oro sormontata dalla corona imperiale dello stesso e portante nel petto una croce patente d’oro. – English: Naples – Blue in color with two natural trees grown on a green field; the upper part is of silver color and supported by the division of the red and loaded with three golden stars; the head itself is loaded with the image of the black-headed bicep eagle, and with its membrate and cupped and crowned with gold. it is surmounted by the imperial crown and carries a golden patent cross in the chest. 8) Sassori – Partito; nel 1° d’azzurro e al crescente d’argento; nel 2° d’argento e a tre trifogli di verde e 2 e 1; il tutto sotto un capo d’oro e al leopardo di nero e armato e Iinguato di rosso. – Cimiero: Un volo d’argento e caricato sopra ciascuna ala di un trifoglio di verde. – English: Sassari – Match; in the first part, blue and a growing silver; in the second, silver and three green clovers; all of it is surmounted by a golden garment and a black, armed and red-colored leopard. – Cimiero (summit): A silver bird with a green clover loaded above each wing.9) Sicilia – D’argento e all’albero sradicato di verde. – English: Sicily – Silver, with an uprooted green tree. 10) Trani – Di rosso all’albero d’oro e sostenuto da due leoni dello stesso e affrontati al tronco. – English: Trani – Red, with a golden tree supported by two lions of the same and facing the trunk. 11) Bari, Giovinazzo – Partito di rosso alla fascia d’argento e di fasciato d’argento e di rosso. – English: Bari, Giovinazzo – Red in color with a silver band and a band of silver and red. 12) Napoli, Trani – D’azzurro a due alberi terrazzati di verde; al capo d’argento all’aquila imperiale di nero, sormontata dalla corona imperiale e caricata suI petto di una crocetta patente d’oro; il capo sostenuto di rosso a tre stelle d’oro. – English: Naples, Trani – Blue in color, with two terraced green trees; in the upper part, in silver there is an imperial eagle of black, surmounted by the imperial crown and loaded on the chest of a golden cross; the head held up in red with three golden stars. 13) Sardegna – Partito nel 1° d’azzurro al crescente d’argento; nel 2° d’argento a tre trifogli posti due ed uno di verde. 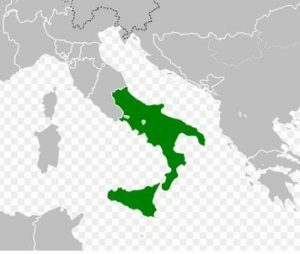 II tutto al capo d’oro al leopardo di nero, armato e linguato di rosso, – English: Sardinia – Partition: in the 1st sector of light blue color with the increasing silver; in the 2nd, in silver, with three green clovers placed two and one. Everything is topped with gold, at the head of the black leopard, armed and red-colored. 14) Sicilia – D’argento a tre bande ondate d’azzurro; al lambello sul tutto di tre gocce di rosso. – English: Sicily – Silver, with three bands of blue waves; to the lambello, on the whole, of three drops of red. 15) Siracusa – Di rosso all’albero di pomo d’oro sostenuto da due leoni dello stesso. – English: Syracuse – Red, with the image of a golden apple tree, supported by two lions of the same. 16) delle LANZE – Abbruzzo – (Ramo Comitale) Di rosso alla fascia ondata d’azzurro accostata in capo da due rose ed in punta da tre lance ornate di nastro poste a ventaglio: il tutto d’oro, alla bordura d’oro. – English: delle LANZE – Abruzzo – (Ramo Comitale) Red colored; with the wave band of light blue color, juxtaposed at the head by two roses and at the tip of three lances decorated with ribbon, placed in the shape of a fan: all of gold, with a golden border. 17) delle LANZE – Lucera, Lettere – D’azzurro all’albero di verde movente da un fiurne d’azzurro e sostenuto da due leoni d’oro; il tutto sorrnontato da tre stelle d’oro. – English: delle LANZE – Lucera, Lettere – Blue in color with a green tree, moving from a light blue river and supported by two golden lions; all surmounted by three golden stars. 18) GIORDANO-LANZA – Lucera – D’azzurro e all’albero di verde nudrito sopra un flume d’azzurro e accostato da due leoni d’oro controrampanti e accompagnati nel capo da tre stelle d’oro. – English: GIORDANO-LANZA – Lucera – Blue in color with a green tree born above a flume of light blue and approached by two contrasting gold lions and accompanied in the head by three golden stars. This popular surname derives from the Italian personal (first) name Giordano. The masculine given name is the Italian version of the Christian baptismal name Jordan, a name taken from the name of the river Jordan, which derives from the Hebrew Yarden, from the word yarad, meaning “to go down” (to the Dead Sea). Other say it means “one who descends” or “to flow down”. The name is varied in many cultures: Urdunn (Arabci), Jordan (Spanish), Jordao (Portuguese), Jourdain (French), Jordaan (Dutch), Iordain (Irish), Jorda (Catalan), Iordan (Romanaian), and Serbian (Srdan). 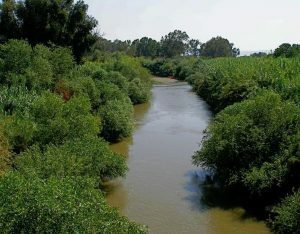 During the Crusades in the Middle Ages, many crusaders and pilgrims would bring back flasks of water from the Jordan River, a river in which John the Baptist had baptized many people, including Jesus Christ the Messiah, and used said water to christen their own children, often naming them Jordan after. As a surname, it means the descendant of Giordano. 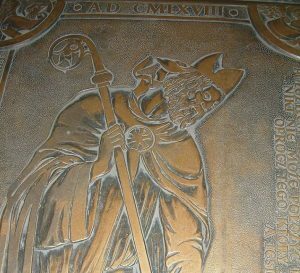 The name was born by many church officials such as Jordan, the first Bishop of Poland in 968 AD, as well as many members of the nobility, including Jordan I of Capua (died in 1091 AD) the Prince of Capua, and Jordan of Hauteville (died 1092 AD), the Count of Syracuse. Some early instances of the name include Giacom Giorando who was born in Torino Italy in 1567 AD, Pietra, son of Giacon Giordana, who was born in Torino, Italy in 1599 AD, and a Tommasa, son of Giordana and Lucia Giordano, born in Savigliano, Italy in 1628 AD. A one Guglielmo Giordani was an Ambassador to Federico Barbarbossa (the German Empire who invaded the north of Italy) and was documented in the city of Genoa in 1164 AD. Once source asserts the name was first seen in Venice, having been documented in Latin as Iordanes or Iordanus as early as the 100’s AD. One of the earliest American immigrants with this name was Giovani Giordano who became a naturalized citizenship in New York in 1869. The name ranks about 1,900th in terms of popularity in the United States and 4,427th in Canada, but is much more popular outside of the English-speaking world: Italy (11th), Argentina (228th), Uruguay (197th), Malta (373rd), Monaco (30th), and San Marino (243rd). In the United States, the name is particular common in the following five states: New Jersey (193rd), New York (372nd), Connecticut (405th), Pennsylvania (958th), and Massachusetts (992nd). Spelling variations and similar names inlucde: Giordani, Giordan, Giorda, Zordani, and Giordanengo. Notable or famous people bearing this surname include: 1) Bruno Giordano (born 1956) who was a professional football (soccer) player born in Rome whose senior career stretched from 1975 to 1992, and who played on the Italian National team for most years between 1976 to 1985, later managing numerous teams from 1993-2016, 2) Luca Giordano (1634-1705) who was an Italian painter during the late Baroque period who was born in Naples and became successful in various Italian cities as well as Spain, 3) Charles Giordano (1854) who was an American accordionist and keyboardist from Brooklyn, New York, known for his work with artist such as Bruce Springsteen and Pat Benatar, and 4) Richard Joseph Giordano (1932-2010) who was a comic book artist and editor known for his work with DC Comics. Gaetano Giordano was born in Corleone, Palmery, Sicily in 1698. He had a son named Antonio who was born in the same town around 1718. He married Giovanna Provenzano and Francesca Cammarata and had the following issue: Natalia, Anna, Calogera, Gaetano, and Vincenzo, and Leoluca. His son Vincenzo Giordano was born in the same city around 1758. He married Ignazia Briganti and had the following children with her: Antonio, Fracesco, Carmela Maria, Francesca, Antonino, Biagio, Calogera, Francesco, Leoluca, Carmelo, and Carmela Maria. His son Antonio was born in Corleone, Palmero, Sicily in 1786. He married Francesa Paola di Fisco, and had the following issue with her: Ignazia, Vincenzo, Crispino, Ignazia, and Liborio. His son Chrispino, a farmer by trade, was born in the same town in 1821. He married Angela Maria Gaglianello and had a son with her named Vincenzo. His son Vincenzo Giordano was born in the same town in 1848. He married Maria Concetta Cascio and had the following children with her: Angelo, Leonardo, Francesco, Giovanna, and Salvatore. 1) Giordani di Casal Monferrato: Apparatenne a questa famiglia Francesco-Federigo Giordani bali dell Ordine militare di. S. Stefano, protonotario apostolico e Arciv. Di Melitene creato da Benedetto XIII ne 1725. 2) Giordani di Genova: Guglielmo ambasciatore a Federico Barbarossa nel 1164. Davide, artifice bianco, fu anziano nel 1509. Nel 1528 egli e suo fratello Giorgi furono ascritti nei Promontorio. Ultimo ascritto al libro d’oro fu Benedetto q. Giambattista q. detto Giorgio senator nel 1596 to 1599. 3) Giordani di Gubbio: Due omonime famiglie, orginaria l’ una di Roma e l’ altra di Pesaro, fioriscono in Gubbio: quest’ ultima fu aggregate alla nobilta eugubina il 22 Nov 1741. 4) Giordani di Pesaro: Originaria del Monte S. Maria, castello del Pesarese, fu trapiantata in Pesaro circa il 1400 da un Giordano, dal quale forse dervio il nome della famiglia. Il figlio del precendte, ser Bartolo, entro nel Consiglio della citta nel 1436 e tolse in moglie Francesa sorella di Monsignor Giovannia-Benedetto Vescovo di Pesaro. Estinta nei primi anni del XIX secolo, e l’ eredita ed il nome passarono nei conti Macchirelli. 5) Giordani-Fantana di S. Dalmazzo presso Cuneo: Originaria di Nocera, trapiantata in Piemonte da un Domenicone Giordano. Motto: Numquam Retrorsum. 6) Giordano di Sassulo nel Modense: Aderente alla fazione mariana chiamavasi nel secolo XV or del Pitocchi ed or dei Giordani; ed il primi di essa che si conosca e Pedretto vivente circa al 1370. Giambattista milito sotto le bandiere di Carlo V e trovossi col grado di capitano alla battaglia di Pavia e al celebre sacco di Roma; il Dott. Melchiorre luogotenente in Sasuolo del Podesta. 7) Giordano di Cosenza: Famiglia feudataria di cui se ne a memoria fino dall’epoca della dinastia angioina. A goduto nobilta nella citta di Cosenza. 8) Giordano di Napoli: Di origine romana e dell’ ordine senatorio, s’ ignora l’ epoca in cui si trapianto nel reame di Napoli, ma fino dai primordi del XIV secolo fioriva in Socilia, in Lecce nel Principato Citeriotre, negli Abruzzi ed in altriluoghi. Iacopo Giordano nel 1214 giudice in Messina; Federico milite verso il 1400 era feudatario di Mazzaria, di Ventico, di Ungario, di Trono e di Milazzo; Antonio consigliere ai Papi Alessandro VI e Leone X. Un Claudio barone di Terra Ruggiero, e Giuseppe Barone di Busso nel 1711. Per matrimonio contratto nel 1683 da Nicolo di Mare-Antonio Giordano con Guilia Vittoria Vitaliano erede di Giroloma barone di Oratino e Roccaspromonte, questa baronia passo in proprieta della cada Giordano. Il barone Gennaro ottenne da Carlo VI re di Napoli con diploma del 10 August 1720 per se e suoi discendenti il titolo di duca d’Oratino confermato con decreto ministeriale del 6 Dic 1882. 9) Giordano di Trani: Altra famiglia distinta dalla precedente e originaria di Roma donde esulo nel secolo CV. Fu ascritta nel 1587 al patriziato di Trani, nel seggio dell Arcivescovato e piu tardi in quello di Lucera di Puglia, ed ebbe il titolo di duca. 10) Giordano-Lanza di Lucera: Originaria di Tramonti e diramata in Lettere, in Melfi, in Manfredonia e in Lucera dove ebbe il patriziato e dove presentemente fiorische. Guglielmo castellano del castello di Belvedere nel 1343; Domenico Patriarca di Antiochia e Vicegerente di Roma; Girolmao dottissimo poliglotta. The primary heraldic symbol depicted within the various Giordano family crests are the tree or pine and two lions rampant. Amongst the natural objects depicted on a coat of arms, trees feature frequently, either in whole or as individual branches and leaves. Sometimes the species or the part of tree was chosen as an allusion to the name of the bearer, as in Argent three tree stumps (also known as stocks) sable” for Blackstock. Trees of course had long been venerated and its use in a coat of arms may have represented some association with the god Thor. There can be no animal more clearly associated with Heraldry than the lion, majestic King of the Beasts. Originally it appeared only in one pose, erect, on one paw, with the others raised but such was the popularity of this figure, and the need to distinguish arms from each other, that it soon came to be shown in an enormous range of forms. The lion rampant is an example of these modified form, and any family would be proud to have such a noble creature displayed on their arms. Rampant is the default attitude of the lion, raised on its hind legs, facing to the dexter and with front paws extended in a fearsome and powerful pose.